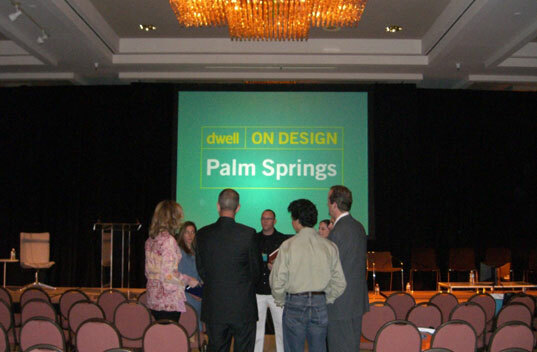 The Inhabitat team is on site here in Palm Springs at the Dwell On Design conference, and we’ve just wrapped up a full day of lectures from distinguished speakers on topics such as Visions of Utopia and the Future of Desert Architecture. This morning’s lineup included a panel discussion and lectures by architects, designers, critics, and historians, focusing on the legacy of mid-century modern architecture in Palm Springs. Alastair Gordon, author and critic, and Gwendolyn Wright, architectural historian, mentioned the rare but significant use of recycled materials in mid-century modern structures, and highlighted contextual regionalism and the integration of the indoor and outdoor, drawing an interesting parallel between Modernism and sustainability. While most of the morning’s discussion centered around the long history of modern architecture in a desert context, we were especially intrigued by the afternoon’s Future of Desert Architecture segment, during which Leo Marmol and Jennifer Siegal spoke about sustainable advancements in their own work and the potential of green technologies for future projects. Jennifer Siegal, founder of the Office of Mobile Design, spoke about the power of technology, materials, and mobility to change the trajectory of the design world towards a more prefab-focused, transient, and practical language. 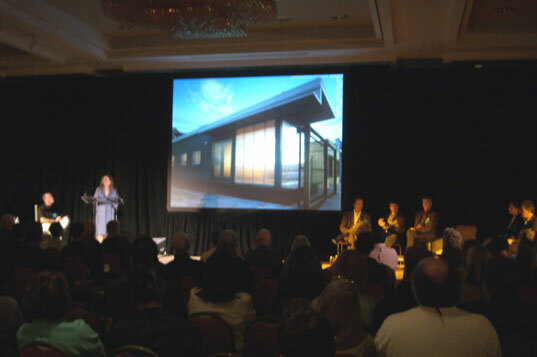 Images of previous projects such as a small-scale mobile classroom as well as current experimental concepts demonstrated Siegal’s commitment to pushing the boundaries of affordable prefabricated structures ($240-$265 per square foot) and reframing the stigma of mobile housing. Leo Marmol of Marmol Radziner closed out the day, examining the future of our built environment and posing the question, “what can we as architects do?” His recent prefab designs came out of this question, not as a solution, but as a “way to feel like we could do something.” He spoke about his prefabrication process and the importance of in-house construction as a means to reduce waste and increase efficiency. His thoughtufl approach to modern green architecture demonstrates a sensitivity to the environment without sacrificing an impeccably-designed modernist aesthetic. Stay tuned for upcoming interviews with Jennifer Siegal and Leo Marmol in the next few days. I am selling my home in Santa Monica and moving to Palm Springs. I love the mid century design that is so much a part of the area. I would love to have a modernist prefab built and would like more info on lots, etc. wish i was there!!! i'm anxious to see pictures + hear more.. 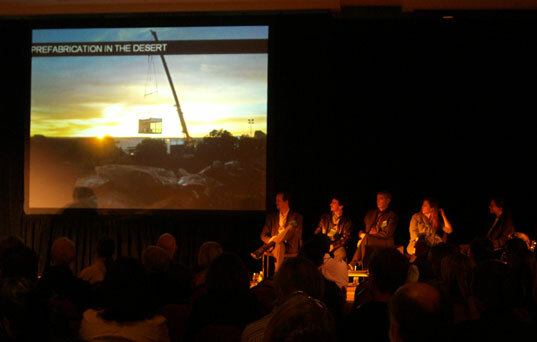 The Inhabitat team is on site here in Palm Springs at the Dwell On Design conference, and we've just wrapped up a full day of lectures from distinguished speakers on topics such as Visions of Utopia and the Future of Desert Architecture. This morning's lineup included a panel discussion and lectures by architects, designers, critics, and historians, focusing on the legacy of mid-century modern architecture in Palm Springs.